Today, movies, television and novels have replaced bards and jongleurs telling knightly tales by the fireside. Yet just like those chivalric stories of the Middle Ages, today’s entertainment media reflect the ideals and expectations of its audience. In the stories that thrill today’s readers and viewers, there has been a rise of a character who is almost completely unique to the modern world: the female hero. Not heroine, mind you, but hero — characters like Buffy the Vampire Slayer, Dr. Kay Scarpetta, Captain Kathryn Janeway and adventurer Lara Croft, just to name a few. Today’s fictional women are the heroic equals of male characters such as Captain Kirk, Indiana Jones, James Bond and Fox Mulder because today, women are the social equals of men, and the boundaries which once separated masculine and feminine roles within society are now disappearing. Similarly, women today have equal rights under the Code of Chivalry. In modern society, a woman is just as capable of being heroic, determined, intelligent or resourceful as any man, yet she is also equally obligated to be kind, respectful, patient, generous and fair. The roles which once separated masculine and feminine behavior (behavior which once prevented a woman from being self-empowered while at the same time making it acceptable for her to “get her way” by being petulant or sulky) are also disappearing. In short, chivalry has become gender-blind. Throughout the development of the Code of Chivalry, women have played a crucial part in the understanding of what it means to be a knight. In the Middle Ages, Queen Guinevere was foremost among the women of romantic literature who demonstrated the need to guide and nurture the growing concept of chivalry to real-life women. Today, a new breed of fictional female heroes are a tribute to modern expectations of gender equality. These characters inspire men and women alike to set new goals for themselves and to venture into new frontiers. One of these frontiers is the Code of Chivalry, where honor, courage, integrity and duty are concepts to which both modern men and women should aspire. 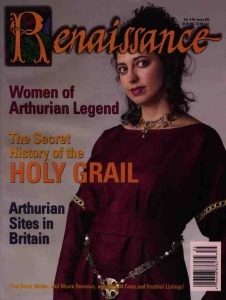 This article originally appeared in Issue #33 of Renaissance Magazine. To find out more about this publication, visit their website.